The SLOWDOWN in exports of Scotch in 2015 was primarily caused by three factors, writes Leon Kuebler at WhiskyInvestDirect. Russia, Brazil, and crude oil. Between them, these three factors accounted for 82% of the overall £102m drop in the value of Scotch whisky exports to £3.85bn last year. That masks a much stronger picture across major markets, led by the United States. Firstly, the effects of economic sanctions – plus the oil price collapse – have combined to virtually obliterate Scotch whisky sales to Russia. Exports of Scotch to Russia in 2015 came in at £0.6m, a 98% decline from the £24m exported in 2013. Not one single bottle of blended Scotch was directly exported to Russia, according to the official data from HMRC released last week. This collapse in exports to Russia has occurred in two stages. At first, only direct exports to Russia were affected, as Moscow retaliated against EU sanctions over Crimea and Ukraine with trade sanctions of its own. Although alcohol was not included in the Kremlin's August 2014 list of prohibited food and beverage imports, exports of Scotch directly to Russia were already down 93% by the end of 2014. Before those sanctions, however, most Scotch whisky destined for Russian drinkers was not being sent directly to Russia, but rather to two Baltic neighbours – Estonia and Latvia. Sales of Scotch whisky in these countries had experienced a meteoric rise over the past decade and continued to hold firm in 2014, even after Russian sanctions ended direct exports. This changed in 2015 as the slumping price of oil, on which half of the Russian government's budget depends, took its toll on the Russian economy. Last year, Scotch exports to Estonia and Latvia declined by £42m as a result. All told, exports to Russia and its two major supplier nations have now sunk by £75.2m, or 47.5%, from 2013. 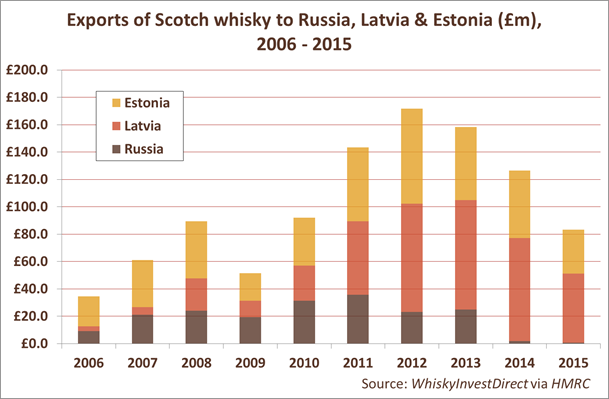 As both Latvia and Estonia are part of the European Union, Russia's collapse had a perverse impact on headline figures for Scotch whisky exports in 2015 to the EU as well. HMRC data states that Scotch inflows to the EU dropped some £51 million compared to 2014; yet over 80% of this regional decline can be ascribed to these two member states, with a combined population of just 3.3 million people. A quick glance at HMRC's regional data disguises the fact that several EU member states saw the value of exports rise sharply last year. The Netherlands, Bulgaria and Poland all posted double-digit growth in value. Germany, the world's 6th largest market for Scotch by value, also grew by 2%, although the continued economic difficulties of Spain, the 5th largest market for Scotch by value, caused a further 9% drop from 2014's figures. Russia, however, was not alone in feeling the effects of the freefall in oil prices. Most major Scotch-importing countries whose GDP is dependent on oil revenue saw a significant drop in whisky imports last year. Oil rent shows how much of a country's economic output comes from the profitability of producing crude oil. It measures the difference between the cost of producing crude oil and the revenue gained from selling it at world prices, as a percentage of total GDP. One oil-dependent state which has managed to buck the trend is the United Arab Emirates, which increased Scotch whisky imports by £6.3m last year. This built on years of steady inflows to Dubai, the services and exports hub of the region. 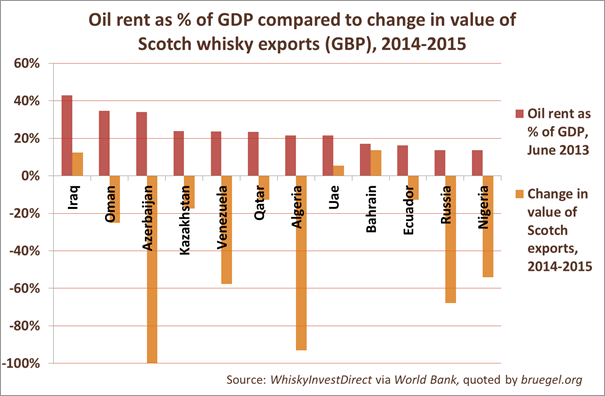 Scotch whisky exports to Venezuela and Nigeria, in contrast, crashed in 2015 by 58% and 54% respectively, accounting for a total drop of £21.2m by value. Those two countries may have dropped out of the world's top 10 oil producers since 2010 (thanks to a mix of poor policy, mismanagement, and the return of supply from Iraq) but petroleum still accounts for 90-95% of their total export earnings, with oil and gas combined contributing more than one quarter of GDP for both countries. Although Venezuela has been hit particularly hard by the downturn in oil prices, the economies of several other Latin American countries suffered in 2015 as well. The region's economy contracted by 0.3% in 2015, with IMF forecasts suggesting this will continue in 2016. As may be expected, Latin American imports of Scotch – a luxury good, with premium products leading penetration of new and 'emerging' markets – fell faster, decreasing by 8% for a total drop of £28.7m last year. Brazil is the main cause of this regional recession, and Scotch imports fell accordingly by some £24m to this country alone. Just like the regional figures for the EU, these data mask the strong performance of several other countries in Latin America and the Caribbean. Twenty-three out of 39 countries in the region actually saw Scotch imports rise in 2015. Indeed, the region as a whole saw a small overall increase if we exclude Brazil and Venezuela. Exports to Peru, for example, rose by 39% – up by £8.8m – while those to Trinidad & Tobago rose by £4.1m, a huge 258% increase. Bottom line? Sales of Scotch, a luxury product, are not immune from developments in regional economies. Yet the majority of 2015's small decline in sales can be attributed to specific contemporary factors. The case of Venezuela, although extreme, illustrates how demand for Scotch continues, and the taste for whisky remains, for when economic conditions improve and allow fresh imports. As a global brand, Scotch whisky remains resilient. Quite unlike the price of crude oil.